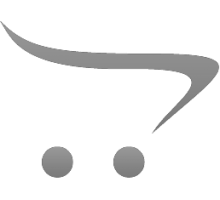 Subscribe to the mailing list to receive updates on new arrivals, special offers and discounts. Tooth Mousse contains RECALDENTTM(CPP-ACP). 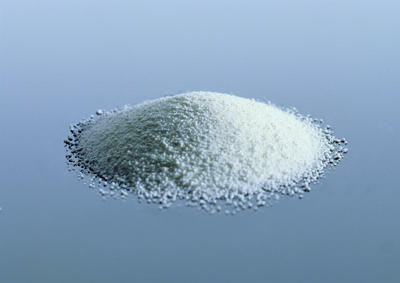 Casein Phosphopeptide (CPP) are natural occurring molecules which are able to bind calcium and phosphate ions and stabilize Amorphous Calcium Phosphate(ACP). Under acidic conditions, RECALDENTTM (CPP-ACP) releases calcium and phosphate ions into tooth enamel4. Supplies calcium and phosphate needed for patients with poor saliva flow. This situation can be further augmented by elevating the level of fluoride. Custom tray application: Extrude a generous layer to tray and position in patients mouth for 3 minutes. MI Paste is digestable if swallowed. Products containing RECALDENTTM (CPP-ACP) should not be consumed by people with milk protein allergies. RECALDENTTM (CPP-ACP) is digestable by people with lactose intolerance. After initial treatment, the tube of MI Paste can be used for professionally supervised at-home follow-up RECALDENT is a trademark of Recaldent Pty Ltd and is used under license. Clinpro Tooth Creme 0.21% w/w Sodium Fluoride Anti-Cavity Toothpaste is an advanced formula containing an innovative tri-calcium phosphate ingredient and is available exclusively from 3M ESPE. The optimized formula makes Clinpro Tooth Crème an outstanding choice. It contains fluoride as well as calcium and phosphate, which are components naturally found in saliva. This proprietary formula successfully integrates these components, enhancing, rather than compromising, the product's performance. During the manufacturing process, a protective barrier is created around the calcium allowing it to coexist with the fluoride ions. Think of this as a bubble that transports the Tri-Calcium Phosphate to the teeth. As the toothpaste comes in contact with saliva during brushing, the barrier breaks down and makes the calcium, phosphate and fluoride readily available to the tooth. The tooth naturally absorbs these components, helping to prevent the initiation and further progression of demineralization and allowing remineralization to occur. The illustration below shows this system in action. Saliva activates the calcium compound, breaking down the protective coating and making it available to the tooth. Practicing dental professionals and industry experts alike will discover the breakthrough benefits of this winning formula. Your patients should, too. The toothpaste that makes every brush better, Clinpro Tooth Creme, is now available. delivers more fluoride to the tooth! Clinpro™ Tooth Crème 0.21% w/w Sodium Fluoride Anti-Cavity Paste contains fluoride and an innovative Tri-Calcium Phosphate ingredient. It helps strengthen teeth and reverse white spots in a single step. Many factors can increase the risk of tooth decay. Clinpro Tooth Crème is a breakthrough in anti-cavity therapy. What is Clinpro Tooth Crème 0.21% w/w Sodium fluoride Anti-Cavity Paste? Clinpro Tooth Crème contains fluoride as well as calcium and phosphate, which are components naturally found in saliva. It is used to prevent and control tooth decay. It can be used in place of your conventional toothpaste. How do I use Clinpro Tooth Crème? 1) Refer to your dental professional on the number of times per day that you should brush with Tooth Crème. 2) Place a thin ribbon or pea-sized amount of Clinpro Tooth Crème on a soft-bristled toothbrush and brush teeth for at least two minutes. a)Spit out without rinsing with water. b)Spit out and rinse thoroughly with water. 4) The optimal time to brush with Tooth Crème is just prior to going to sleep. 1) To be used only on the advice of a dental professional. 2) Tooth Crème should only be used under direct supervision. 3) Use only a pea sized amount. b) Spit out and rinse thoroughly with water. 6) The optimal time to brush with Tooth Crème is just prior to sleep. Keep out of reach of children under 6 years of age. Repeated swallowing of high levels of fluoride may cause chalk-like, lacy markings on teeth (dental fluorosis). For this reason, children with baby teeth (developing dentition) require adult supervision to minimize or prevent swallowing of excessive amounts. GET Rs 200/- CashBack on purchase of this item. 3) Proven 20 years clinical experience with Ketac Cem Radiopaque. 6) Low sensitivity to moisture. 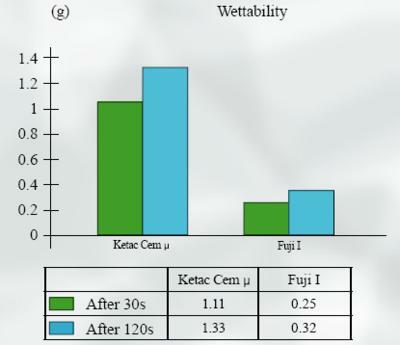 The Wettability of Ketac Cem powder and its ability to absorb liquid were significantly better than the tested competitor material. Cements with polyacrylic acid in the form of a powder show a trend to have lower solubilities. *The bond was subjected to pressure stress 20-30 sec. after end of mixing time. Lower film thickness ensures ease of seating while minimising the potential for occlusal adjustments. 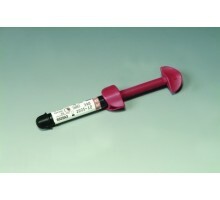 3M ESPE alginate impression material have trusted technology for reliable impressions. For decades, 3M ESPE has been the trailblazer in the glass ionomer success story. Just like you as a dentist, we see a real need for differentiated therapy. Thus, glass ionomers are only part of our comprehensive product offering. Ketac Molar filling material retains all the proven and reliable physical properties of the original Ketac Molar glass ionomer material. It's proven itself in studies to be more reliable, hygienic and easier to mix than competing glass ionomer products. Ketac Molar filling material provides excellent wear resistance and flexural strengths, counteracting the stresses and preventing the restoration from fracturing. What makes Ketac Molar Easymix filling material different from other standard glass ionomers is its advanced granulated formulation. 1) More flowable – a pourable powder means more accurate dosing, resulting in more accurate powder/liquid ratio. 2) More hydrophilic – the liquid component is quickly absorbed with less mess, so mixing is faster and easier. 3) Easier to handle – less sticky and produces less dust than other competing glass ionomer products. 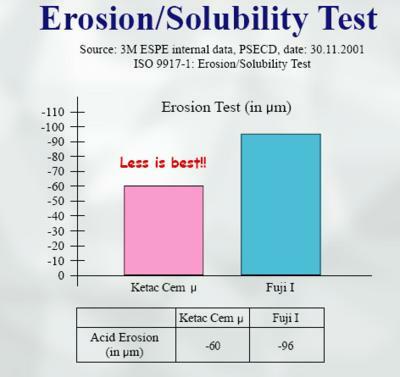 Ketac Molar Easymix glass ionomer demonstrated lower acid erosion than competing glass ionomer products. 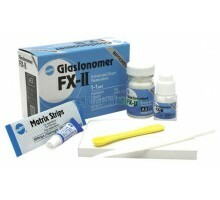 Ketac Molar Easymix provides the same excellent wear resistance as other glass ionomer products. According to dentists participating in testing, 86% said Ketac Molar Easymix filling material produces less dust than Fuji IX GP™ Handmix. * Based on pre-launch trials. Including ARTKetac Molar Easymix is well suited for Minimal Intervention Dentistry (MID) and Atraumatic Restorative Treatment (ART). Ketac Molar Easymix is self- adhesive, requiring no secondary adhesive treatment. 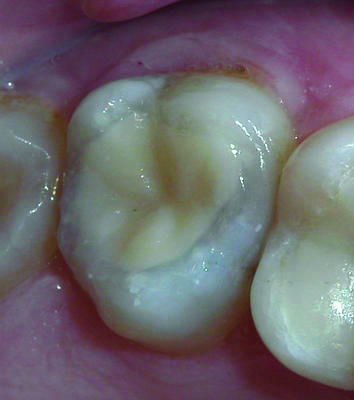 The adhesion surface may be pretreated to prepare for the restorative (optional). Ketac Molar Easymix adheres to both dentin and enamel, minimizing bacterial microleakage. Contains spherical silver-tin alloy particles in a specially formulated glass ionomer powder. Improved physical properties ensure better performance even under humid conditions. Excellent adhesion to tooth structure, pins and amalgam. GC Gold Label 2 is a self-cured glass ionomer restorative with high resistance to water and can be finished in just 16 minutes (under water spray). Its high surface hardness provides for a durable restoration. Reduced moisture sensitivity, so final finish may be completed under water in 20 minutes from start of mix. New enhanced glass ionomer restorative cement, ideal for restoring Class III and Class V cavities, Cervical abrasion/erosion and for filling deciduous teeth. 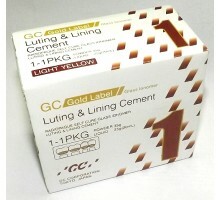 GC Gold Label 1 is glass ionomer cement designed for the final cementation of crown and bridge restorations. Fuji I chemically bonds to tooth structure and metal providing excellent strength and marginal integrity for long term restorations. 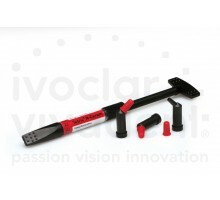 It's also well suited for securing metal inlays, onlays, posts and orthodontic brackets. 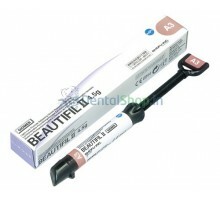 DPI Restorative Type II cement is specially fabricated glass ionomer cements available in two shades: A2 and A3. 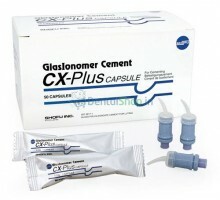 Used to restore tooth structure loss, resulting from dental carries. 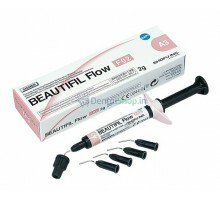 Used as a liner with composite restorative materials. 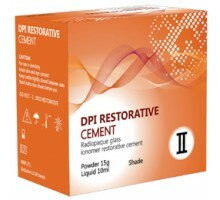 DPI Restorative Cement is available in powder/liquid form. For securing metal orthodontic appliances. 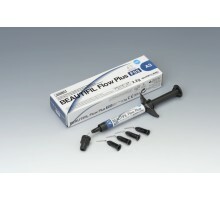 Packable, general purpose, direct restorative, designed for ART and MI (Minimal Intervention) dentistry. Pediatric restorations and Geriatric restorations. Less soluble in oral fluids. Comes in hard-mix powder/liquid or convenient premeasured capsules. RECOMMENDED INDICATIONS For the prevention of water and saliva contamination to exposed surfaces of glass ionomer cements during the first 24 hours after placement. 2) Accurate, reproducible dosing to ensure predictable viscosity. Ketac Molar Easymix filling material retains all the proven and reliable physical properties of the original Ketac Molar glass ionomer material. It's proven itself in studies to be more reliable, hygienic and easier to mix than competing glass ionomer products. 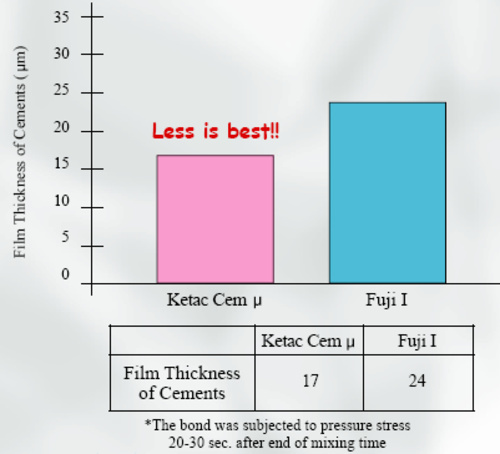 Ketac Molar Easymix filling material provides excellent wear resistance and flexural strengths, counteracting the stresses and preventing the restoration from fracturing. Ketac™ Molar Easymix granulated powder provides good flowability for more accurate and reproducible dosing. 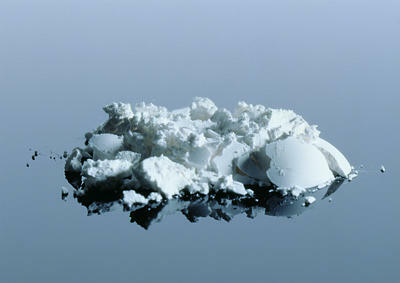 Conventional glass ionomer powder becomes compacted during storage and when dispensed with the spoon; dosing is not consistent. 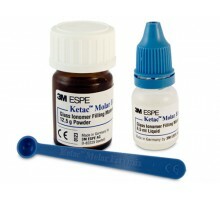 Ketac Molar Easymix offers greatly increased absorption of liquid for faster, easier mixing. Conventional glass ionomer compounds are not as readily absorbed, so not as easy to use. Why more dentists prefer Ketac™ Molar Easymix glass ionomer* filling material over other brands of handmix glass ionomers. Ketac Molar Easymix is well suited for Minimal Intervention Dentistry (MID) and Atraumatic Restorative Treatment (ART). Ketac Molar Easymix is self-adhesive, requiring no secondary adhesive treatment. 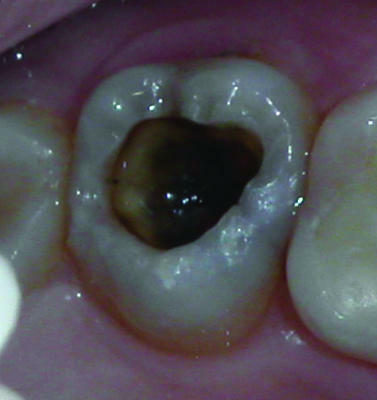 The adhesion surface may be pretreated to prepare for the restorative (optional). Ketac Molar Easymix adheres to both dentin and enamel, minimizing bacterial microleakage. Here are two frequently asked questions and answers about product compatibility that will help you achieve outstanding results and protect the product integrity. The answers are also helpful when ordering. Question: Can you mix Ketac Molar liquid with Ketac Molar Easymix powder? Answer: No. Ketac Molar Easymix powder must only be used with Ketac Molar Easymix liquid. If Ketac Molar Easymix powder is mixed with other liquids, the acidic concentration of the restorative material alters. This can lead to post-operative sensitivity. In addition, the mechanical properties of the material are impaired and the setting speed slows down. Question: Can you mix Ketac Molar Easymix liquid with Ketac Molar powder? Answer: No. Ketac Molar Easymix liquid must only be mixed with Ketac Molar Easymix powder. 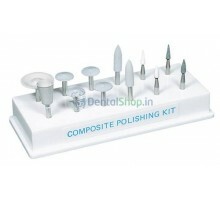 Composite Finishing kit FG is recommended for fast and efficient finishing in conjunction with the Composite Polishing kit. Mini disks provide perfect control when polishing cervical areas. Polystrips correspond to the color coded grit of the disks, are ultra thin for easy access to interproximal areas. Disposable, aluminium oxide impregnated buff disks, for super polishing of direct tooth colored restorations with an easy to use snap-on system. Can super polish multiple surfaces in a single round without the mess of polishing pastes. The Enhance Finishing and Polishing System combines several products designed to finish and polish all types of resin restoratives. The Enhance finishing disc, cups and points are abrasive, flexible devices which complete intermediate and final finishing without the need to change discs. 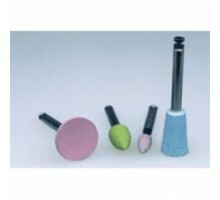 The Enhance foam polishing cups are foam polishing devices used to buff and polish the restoration in conjunction with a polishing paste. Prisma Gloss and Prisma® Gloss Extra Fine are composite polishing pastes - when used successively they provide a "microfil-like" surface on hybrid composites. Prisma Gloss and Prisma Gloss Extra Fine are a fine-grit aluminum-oxide powder suspended in a glycerine base. They are designed to produce a natural looking finish on both anterior and posterior resin restorations. They are particularly effective on composites such as TPH® Spectrum® Restorative where it creates a high-gloss surface. Diamond impregnated polishing paste for intra-oral polishing of natural teeth after cosmetic contouring, porcelain or composite restorations. 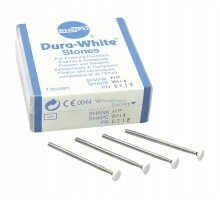 Dura-White Stones are ideal for finishing enamel, glass ionomer cement, composite, porcelain and prepared tooth abutment. Dura Green and Dura Green Fine stones are made of high quality silicon carbide grit, are durable, and have excellent cutting efficiency. 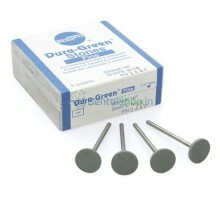 Dura-Green Stones - for fast contouring and finishing of porcelain, composite, precious alloys and amalgam. Dura-Green Fine Stones (yellow band) - for adding surface characteristics and adjusting details on porcelain and composites. Dura-Green stones are available in a variety of shapes in HP and CA shank and selected number of shapes in FG shank. Dura-Green Fine Stones are available only in HP shank. Specially created for finishing and polishing of direct aesthetic restorations with only one instrument. One Gloss polishers are disposable, saves times and are made using a high concentration of aluminum oxide with silicone as a binder. A versatile, highly aesthetic direct restorative material, designed to effortlessly craft undetectable restorations for anterior and posterior teeth. 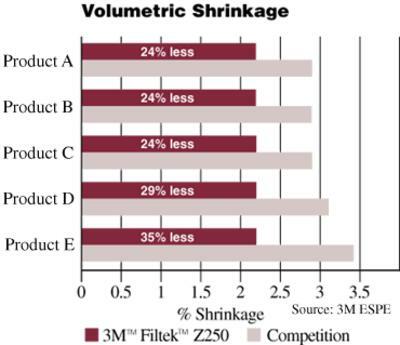 3M ESPE Filtek Z250 restorative provides low polymerisation shrinkage for less stress on the tooth and less sensitivity potential for your patient. Filtek Z250 universal restorative gives you strong, long-lasting and natural-looking tooth restorations. Available in 15 shades to meet patient needs. 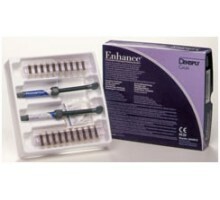 An injectable nano-hybrid with giomer benefits and offers life-like aesthetics. Possess ideal viscosity to easily shape restorations. 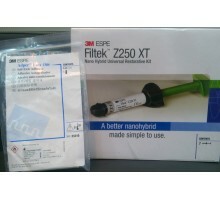 3M ESPE Filtek Z250 XT Universal Restorative is the solution for your everyday restorative needs. Formulated for strong, reliable performance. With Filtek Z250 XT restorative, you can satisfy patient expectations for a natural-looking, high quality restoration. Nanohybrid formulation resulted in high flexural strength, diametral tensile strength, wear resistance and improved polish retention. When you place Filtek Z250 XT restorative, you can trust in a reliable outcome. 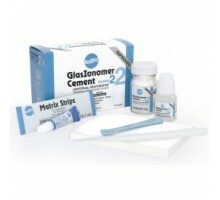 Easy to use in all classes of direct restorations. Our nanohybrid is designed to be easy to use, whether creating anterior or posterior restorations. With 12 popular shades that match the Vita Classical Shade Guide, you’ll find it easy to match the patient’s natural teeth. Filtek Z250 XT restorative is formulated for strong performance and is easy to polish – so you can count on predictable, reliable, patient-pleasing results in any indication. 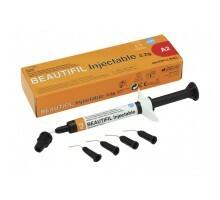 Package Contains :- Sealed, Never opened 6x Filtek Z250 XT refill syringes - 3 GMs (Shades 1x A1, 2x A2, 2x A3, 1x A3.5 and 1x Opaque A2). Match with the Filtek Z350 Universal Restorative. Make it ideal for a variety of indications,including as a base/liner, pit & fissuresealant, and Class III and V restorations. Because of the nano-hybrid technology, Tetric N-Ceram features excellent mechanical properties. 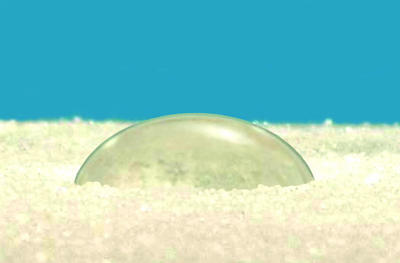 The prepolymers are responsible for the material's low shrinkage. 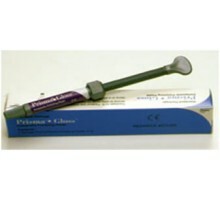 Tetric N-Ceram's high radiopacity of 400 % Al is due to the filler ytterbium fluoride. It considerably facilitates the radiographic detection of secondary caries. Tetric N-Ceram's nano-optimized formula forms the basis of the material's low wear and high strength. The nano-modifier contained in Tetric N-Ceram imparts the material with outstanding modelling properties. The material does not stick to instruments. Nano-particles are responsible for the material's exceptional polishing properties. The integrated nano-colour pigments are characteristic of the technology used in Tetric N-Ceram. Together with the natural translucency of the material, they create a chameleon effect. 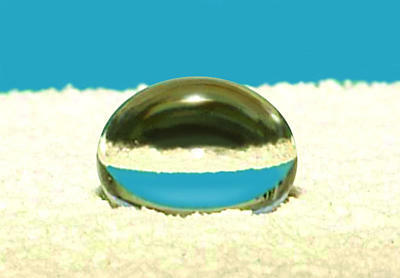 The nano-colour pigments feature a spherical structure. As they are homogenously distributed in the composite, they are responsible for improving the adjustment of the shade of the restoration to the surrounding natural teeth. As a result, very beautiful restorations are achieved, which are hardly distinguishable from the natural tooth structure. Tetric N-Ceram is available in 16 shades: two dentin shades, ten enamel shades, a highly translucent incisal shade and three bleach shades. Tetric N-Ceram forms part of the Tetric N-Collection, a comprehensive composite restorative system for the fabrication of high-quality standard restorations. All the products of this system are coordinated with each other to ensure clinical success. Apart from the universal composite Tetric N-Ceram, Tetric N-Collection comprises the flowable composite Tetric N-Flow as well as the total-etch adhesive Tetric N-Bond, which is best used in conjunction with N-Etch, a 37% phosphoric acid etching gel. In addition, the self-etching adhesive Tetric N-Bond Self-Etch is available. 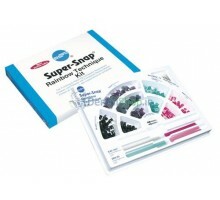 Charisma Smart provides the smart way towards natural everyday restorations. 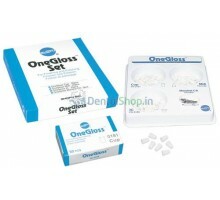 It is an uncomplicated universal composite for everyday restorations with great value. We developed this light-curing, radiopaque filling material to cover your requirements for composite workability. You benefit from its colour-stabilizing technology and easy polishability:These features prevent staining of composite restorations in the long run and thus ensure natural results with little effort. On top, they bring convincing ease to your workflow. You feel comfortable with its easy handling characteristics and vital shades:The composite facilitates simple single-shade layering techniques for natural everyday restorations with great value. Its excellent handling and modelling properties arise from our long-standing experience in composite technology. In short, Charisma Smart provides the smart way towards natural everyday restorations. Charisma Smart comes, of course, with the quality and reliability that arise from our long-term experience in composite technology. It’s just smart to benefit from the great value of Charisma Smart. MiCD (Minimally Invasive Cosmetic Dentistry) is aimed at providing a holistic treatment approach with emphasis not only on aesthetics but also on the psychology, health and function of the patient. Shofu understands the need for MiCD and is fully committed to support the movement through the contribution in developing and providing dental professionals with aesthetic biocompatible materials to achieve their goals. The MiCD kit contains carefully selected restorative materials and tools which help in creating aesthetic restorations with predictability. To mask discolorations when restoring deep cavities with affected dentin and creating direct veneers for cosmetic restorations.